ast month I traveled to San Francisco, California to watch a concert and at the same time explore. I've always wanted to visit SanFo and because of this concert I thought it was the perfect time to go there. 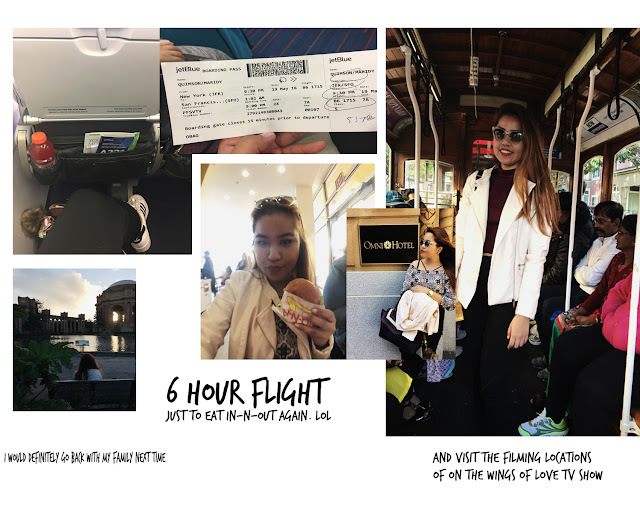 I took the 9 P.M flight from New York to SFO and got there around 1 A.M. The original plan was to stay at the Airbnb I booked near Union Square but since the host made a mistake on the booking dates, I stayed in Daly City overnight. 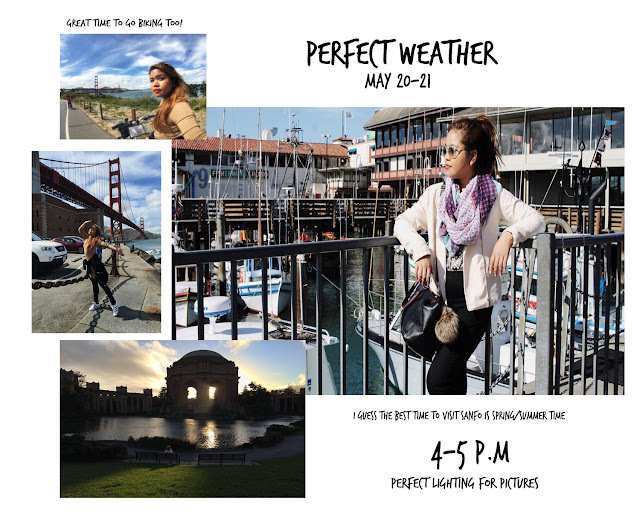 The first day I walked around SanFo and checked out the famous spots from the hit drama show in the Philippines, On The Wings of Love. I also had to ride the cable car/trolley which was amazing! I suggest you buy the 2 day unlimited ride for $30+ because one ride costs $7.50. Also, the line to the trolley is really long so expect 30-60 mins wait. I have a few favorite places in SFO. I really loved Palace of Fine Arts, it was so pretty! I also enjoyed Pier 39 at the Fisherman's Wharf. And my most favorite was Japan Town! You have to check it out. If you decide biking from Fisherman's Wharf to Vista Point, you really need to be prepared for a lot of pedaling because it took me 3 hours roundtrip. But it was all worth it! I wasn't able to eat clam chowder which was in my bucket list because the lines at the restaurants were crazy. I just had to get an animal style burger at In-N-Out and I was good. San Francisco is just like Manhattan except for the uphills and downhills! In Manhattan I can just walk non-stop and I would not care how far I've walked. But in San Francisco, I got really tired! I complained a lot (haha). And yes, I used Uber a lot! 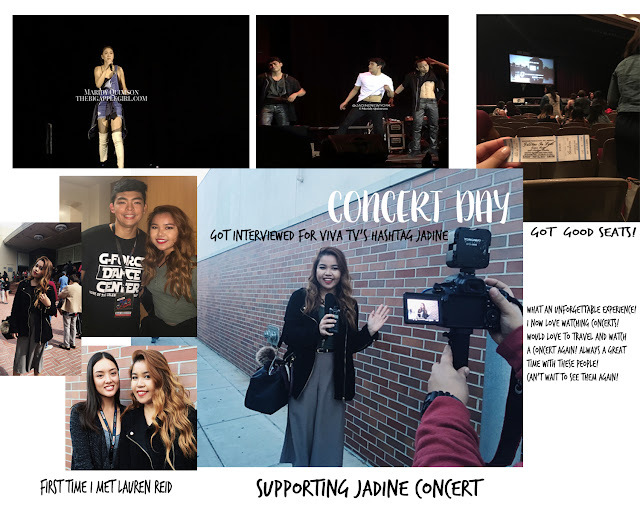 On the last day of my stay before traveling back to New York, I watched the JaDine High On Love concert. You should read my previous post so you'll know what I'm talking about. I had a wonderful time as it was my very first Filipino concert. I never thought I would travel to another place just to see an artist. It was fun! I met the promoters, artists and the production staff for the first time as I've worked with them in NY and DC after that. I got to meet James Reid's sister, Lauren Reid, who was so sweet. I hope to feature her in my blog one day. Oh, and I got interviewed for the show #JADINE on Viva T.V in the Philippines. I wish I can watch it on Youtube too!